This dress makes me feel like I’m wearing pajamas! I mean, fancy pajamas, but pajamas none the less. It’s so comfy I might die. I ended up wearing a cami under it because it was just a tad too low to wear as a teacher, but still. So comfy. 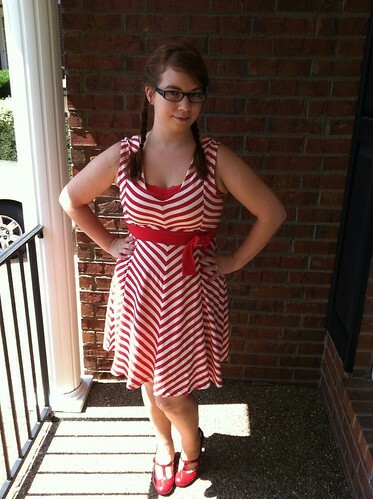 It was one of my purchases in the Last Hurrah Sale on Modcloth, so I only paid $14.99 as opposed to $49.99. It’s more than worth it. It’s incredibly comfy, it’s great for the unpredictability of Nashville weather (pouring rain yesterday, 90 degrees and perfect today, what gives? ), and I can layer it easily in the winter. My hair was another day of “I just don’t curr.” Originally I had it in a pretty half-up fishtail, all fancy-like and Pinterest-y, but my hair was so unruly and frizzy that dutch braids it was! I had another day of doing absolutely nothing at work. Seriously. With the high school students gone and not having aftercare, I went in and worked on show things for two hours, then went home and watched the X-Files. It was amazing. I felt like I was getting away with something. Of course, now I remember I need to get my lesson plans together for next week. COME ON, CAITLIN. GET IT TOGETHER. Also, these shoes are finally broken in. Awesome. Only took a year.